I’m highly impressed with this story and the author. 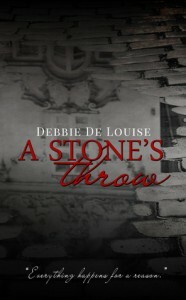 The writing is great and Ms. DeLouise has a gift describing in detail the setting and actions. There were times I felt that I was right there in Cobble Cove with Alicia having some tea and muffins or a PB&J. I loved these characters and how it all unfolded at the very end. I was expecting a dark twist that probably would have upset me but I was happily surprised and closed this book with a sappy smile on my face. I do have to add that Ms. DeLouise did a fantastic job at twisting and then unraveling each detail of the mystery and I absolutely loved how it all tied together! Alicia just lost her husband six months ago in a hit and run accident and to overcome her grief, she feels that it’s necessary to sweep up some lose ends with his past. She travels to Cobble Cove and meets John immediately. Both are drawn to the other and they proceed to try and uncover all the mysterious things that are starting to happen since she showed up. It’s an Agatha Christie meets a small town living! Recommend to – Anyone who loves a great love story within a mystery.